Ford Territory: "A very unique product"
Ford Motor bills its new midsize crossover for China as an affordable SUV that slots between the EcoSport and Kuga. 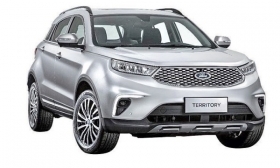 The Territory, to be introduced early next year, was developed with Ford's joint-venture partner, Jiangling Motors. The vehicle comes with a gasoline engine, a 48-volt mild hybrid system or a plug-in hybrid powertrain. Available technology includes an infotainment system with Mandarin voice command and the automaker's Co-Pilot360 suite of driver-assist features. "It's a very unique product for China," Jim Farley, Ford's president of global markets, told Automotive News, a sister publication of Automotive News Europe. Ford is targeting entry-level customers outside of China's biggest cities. It says midsize utility sales in that country grew 38 percent from 2012 to 2016. Ford is preparing a product blitz for China as sales and profits continue to fall there. It plans to launch more than 50 new vehicles there by 2025.